The Farmhouse consists of a master bedroom with a king bed, a loft bedroom with a king bed, a great room, kitchen, dining area, screened porch, a covered front porch and a deck in the rear. 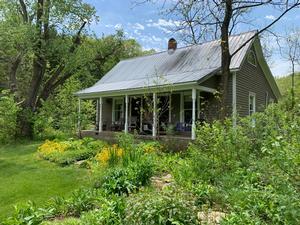 Fox Hollow Forest ﻿features a secluded vintage 1914 classic Missouri farmhouse with purposeful and quaint amenities. The Farmhouse at Fox Hollow consists of a great room with vaulted cedar ceiling, kitchen, dining area, master bedroom with adjacent bath, loft bedroom, screened porch, covered front porch and rear deck with fire pit. This rural cottage, with its original native oak structural frame, was completely renovated in 2001 utilizing green and sustainable practices and materials including the use of recycled/repurposed windows, doors, cabinetry, lighting, ceiling fans, bathroom fixtures and interior wood finishes. Other features include cellulose insulation in the ceiling and walls, corrosion resistant metal roof, 2400 gallon cistern (harvesting rainwater from the metal roof), propane-fueled heating stove, a fully renovated master bedroom bath complete with flush toilet, and rebuilt/enhanced foundation and floor joists. Outbuildings related to The Farmhouse include a vintage 1930's side barn for tool and equipment storage with stone-walled root cellar, and an architecturally interesting outhouse utilizing repurposed materials currently under construction. The Farmhouse provides a comfortable venue for entertaining guests and offers a cozy "base camp" for a weekend stay by the owners. The official local radio station of The Farmhouse at Fox Hollow is the jazz, blues, soul, and rhythm & blues sounds of KJLU 88.9FM, the voice of Lincoln University, Jefferson City, MO. To listen on-line, GO HERE. For guests staying at The Farmhouse, the PDF attachment "A RESOURCE GUIDE" below offers some helpful tips.